In his hearing before the European Parliament yesterday, incoming Commission Vice-President Frans Timmermans pledged to introduce a change of culture into the EU’s decision making. This, he argued, includes much broader transparency than has been the case up until now. The European Parliament, as well as the Brussels-based press corps, responded very positively to the eloquent polyglot, former Minister of Foreign Affairs, and one-time Minister of European Affairs. 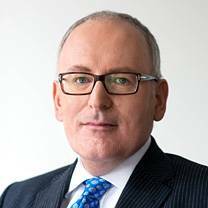 Timmermans answered questions from MEPs in Dutch, English, French, German, and Italian, and didn’t miss a chance to apologise for not speaking Polish and praising Poland for liberating his father’s home town at the end of the Second World War. According to expectation, Timmermans was approved for the position of First Vice-President and Commissioner for Better Regulation, European Human Rights hours after the hearing.